Thanks to the generosity of the Texas Pioneer Foundation, the Blinn College Foundation, and the Blinn College Alumni and Friends Association, the Blinn College District's Mobile Go Center comes equipped with 17 laptops, internet access, and a big screen TV. This 42-foot center allows Blinn to reach out to students who may not have the availability of internet access at home or the ability to get to a nearby campus to apply for college or fill out the FAFSA. In addition, the Mobile Go Center gives Blinn the ability to reach out to younger students with applications such as Career Cruising or Reality Check. As a representative of the community, we ask that you invite us your school, community events, sporting events, county fairs, parades or any other event where we could be of assistance. We would be more than happy to bring the Mobile Go Center to serve as a resource for your community. 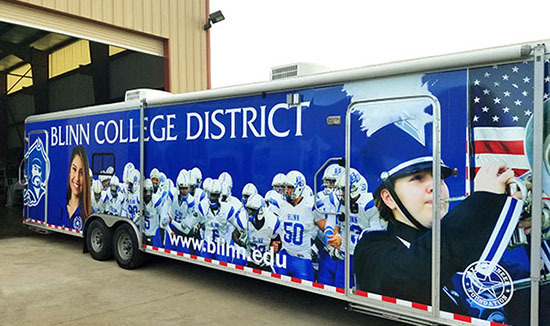 If you are interested in any of the services the Blinn College Mobile Go Center has to offer, click here.